Bank Of Baroda Acquisition Manager Recruitment 2019: Those who are in search of Bank Jobs can check this Bank Of Baroda latest notification. This is a huge vacancy and going to recruit the posts of Senior Relationship Managers & Territory Head Posts. The available vacancies are 100. And the posts are distributed among them. We insist the aspirants check the post wise details and submit to this BOB Senior Relationship Manager Recruitment if they are eligible. The Aspirants can check the Experience that too with this job qualifications also. The link for the BOB Senior Relationship Manager Application Form has also given below. Use this opportunity and apply before the due date i.e 29th March 2019. We also place the Syllabus for the post to perform well to grab a high score. After applying they need to visit the site regularly to know further details of these Bank Of Baroda SRM Jobs. 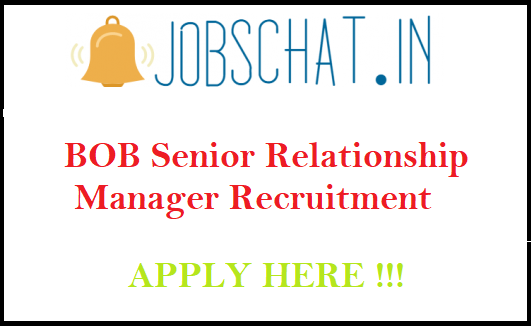 As per the Candidates those who are experienced Candidates in the respective field only eligible for this BOB Senior Relationship Manager Jobs 2019 Notification. Respective Experience details with salary package also mentioned in the Bank Of Baroda SRM Notification. Aspirants need to upload the necessary documents while applying. The Candidate needs to select the BOB job location shown in the application. The Officials have the right to reject any application without any intimation. So, the BOB as a part of selection will conduct the written and interview for the applied candidates. The Admit Card link will be released soon for attending the exam. Those who perform well they will get shortlisted for the job. On the Homepage, aspirants need to find the BOB Senior Relationship Manager Notification 2019 link and open it.